There are so many factors that go into planning a wedding and a new life together. Between the budget stress and trying to get everything coordinated, the last thing you want to do is pay a large amount of money for a ring, on top of everything else. Luckily for you, our men's designer 5mm domed milgrain polished finish with comfort-fit 10k white gold wedding band comes with the classically cool style you are looking for, without the price tag. This is the perfect option for a groom who likes the simple things but wants a little extra something on his band. With a shining polished dome profile, finished with milgrain edges, this ring offers a timeless appearance he is sure to love. Our designer 5mm domed milgrain polished finish with comfort-fit 10k white gold wedding band is made with your groom in mind, offering a comfortable comfort-fit band. Our comfort fit bands are made with extra metal for exceptional comfort and do tend to run a half size small, so be sure to have your groom’s finger sized by a professional jeweler before ordering. 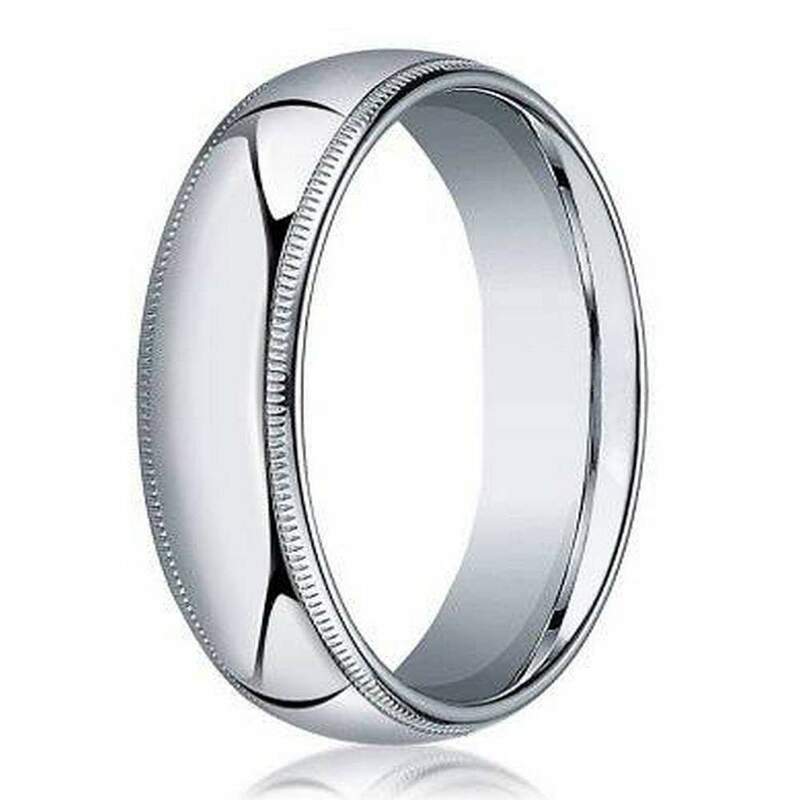 For a final touch, add engraving up to 30 characters to the men's designer 5mm domed milgrain polished finish with comfort fit 10k white gold wedding band. I bought this ring for my husband for Christsmas. I was so happy it came in on time and fit him. He has been wearing it everyday and it looks so nice. Reviews have helped me in the past so I wanted to write this review. I recommend the comfort fit as it is more comfortable than my husbands last ring.